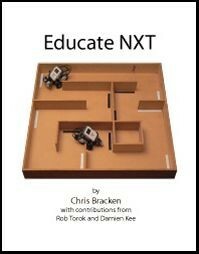 Educate NXT is the ultimate NXT robotics resource for teachers and students. Graded Student worksheets are accompanied by extensive Teacher sections covering topics including Navigation, Line follow, and Sumo. This is further supported by animated PowerPoint presentations, ideal for teachers new to robotics, or teachers with experience wishing to extend their students. Two years of worldwide research and trialing has gone into preparing a book that meshes educational outcomes with LEGO® robotics. Teachers will find out how to successfully and confidently manage a robotics program within their school. A wide-ranging series of additional challenges round off an NXT resource written by teachers, for teachers. Educate NXT gives educators control within the robotics classroom yet fosters learning freedom and the buzz of student engagement. Weiterführende Links zu "Educate NXT"